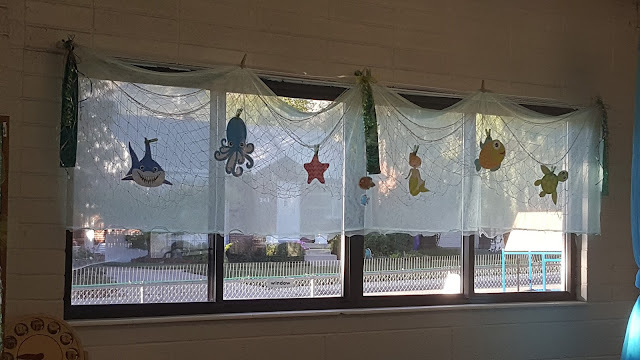 New Preschool Classroom Decor - "By the Sea"
I have spent about a month working nonstop to decorate my large preschool room in an Ocean Theme. DISCLAIMER: I used the graphics from SGS, but also added a few additional ocean graphics that I thought went well with SGS's By the Sea collection. www.schoolgirlstyle.com I am super happy with the way it has turned out and want to show you some pictures. I purchased School Girl Style's "By the Sea" Collection of graphics and fonts, letters, labels and way more. Go over to Melanie's amazing classroom decor site at School Girl Style and find dozens of tempting and dreamy decor collections for all types of classrooms. About 2 years ago I used the "Bugs" theme and loved it too. I highly recommend checking out this site when you are ready to add some color and congruity to your classroom. The design collection Melanie has created includes carnival, rainbow, camping, woodsy, jungle, ocean, Broadway, and many, many more themes. It's a great way to decorate every square of your classroom in a particular theme and this includes banners, labels, alphabet, calendars, centers, themed graphics, such as animals..... By the way, I am NOT in ANY way affiliated with this company, just love her stuff!!! 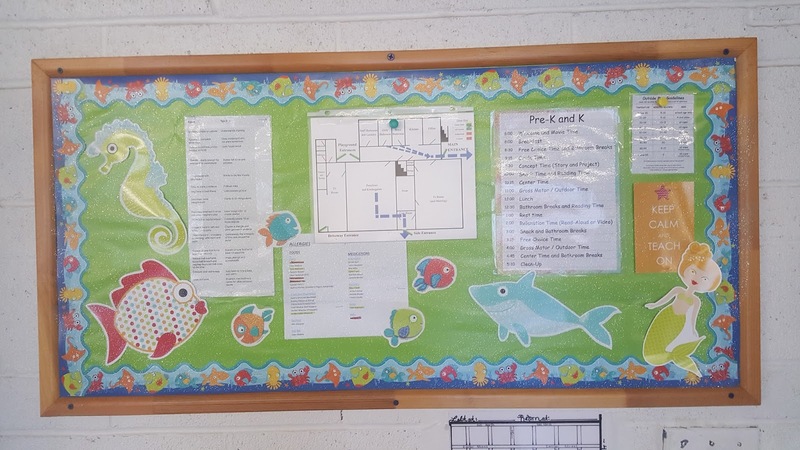 These two boards are for teachers and parents INFO and NEWS! It's hard to see that there is a blue, glittery net fabric covering the board above. 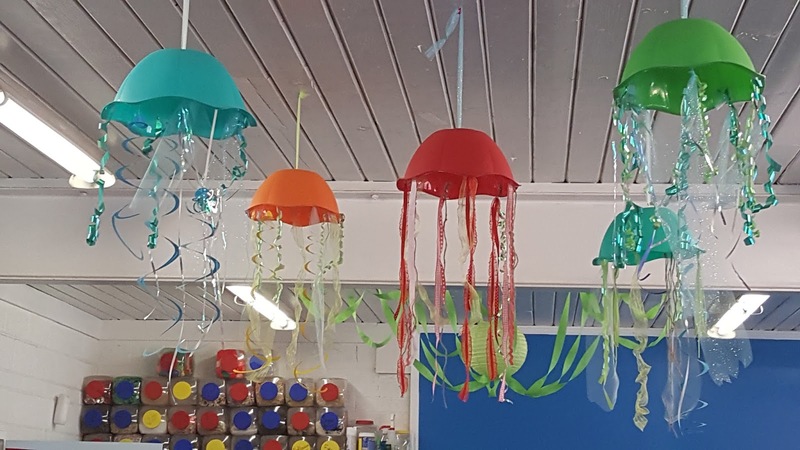 Everything looks as though it is under the sea though. 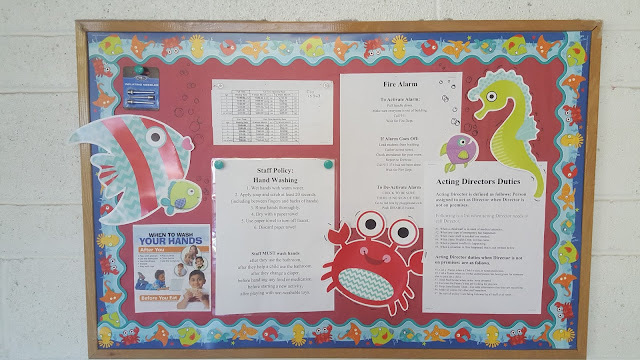 This is another teacher/parent board. Sea animals are graphics, once again, from the By the Sea Collection at School Girl Style!!! Love this website and her designs for classrooms! I found this super cool map at Costco, along with one of the USA. Around the borders are small squares with pictures from the map in each. 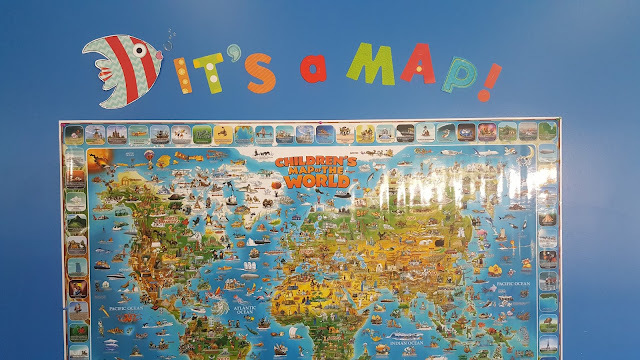 The children have to try and locate the picture on the map. I'm going to add a magnifying glass on a smallish rope. These maps are big, about 4.5 feet wide and 3' feet tall. They were $13. The kiddos love trying to search out the pictures on the map. 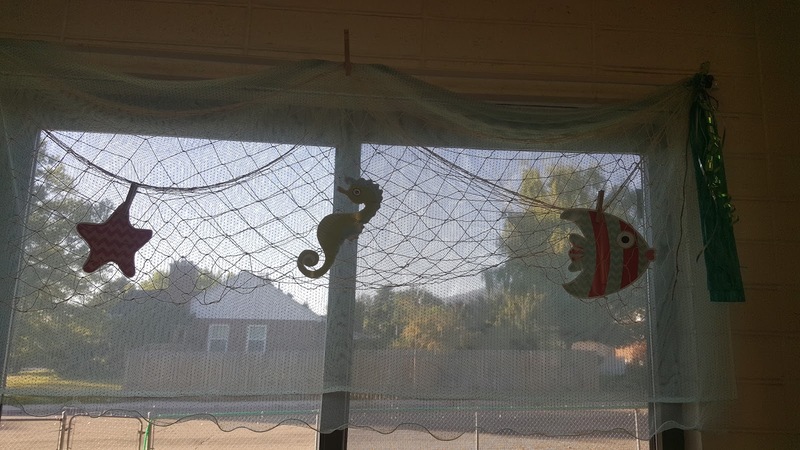 For OCEAN THEMED curtains, I bought a light turquoise blue netting fabric at JoAns. It was about $4 a yard, but was also on sale, so I got a great deal on it. It's not the super stiff kind, but that stuff only costs $1.25. Once again, it's really hard to tell the color of the fabric due to the sun and light, so I'm retaking them asap. I simply draped the fabric every 3 feet and then tacked it up with a clothespin. SUPER SIMPLE!!! I DIDN'T SEW A THING! 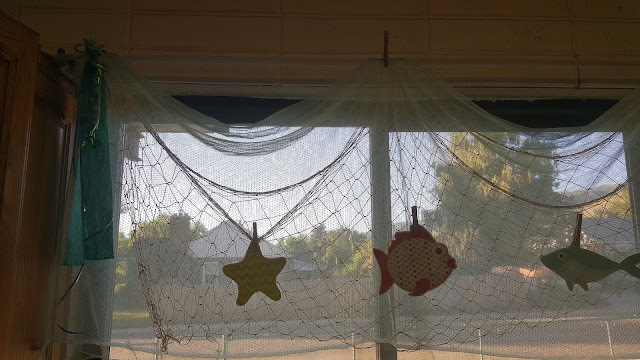 On top of the netting fabric is a fishing net that I got for $1.00 at All a Dollar over the summer. 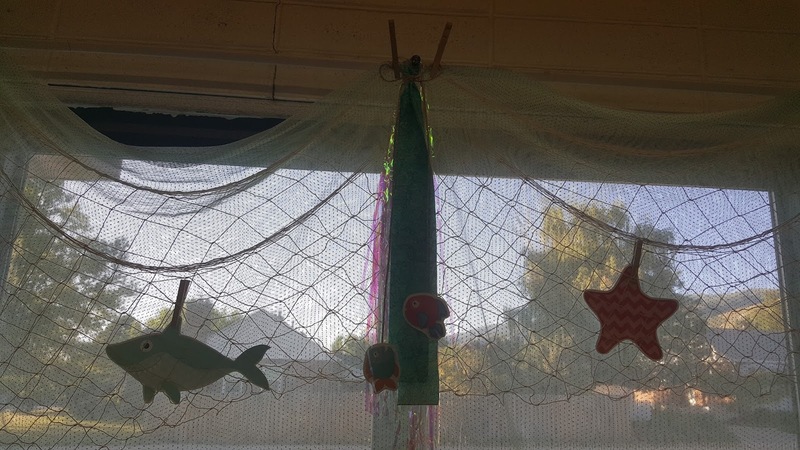 I attached the ocean animals inside the netting with clothespins as well. It makes it look like the animals are caught in the net! I like these CURTAINS, because they add color and charm, without taking away the sunlight! I also added 2" x 20"strips of fabric on the ends of the windows. 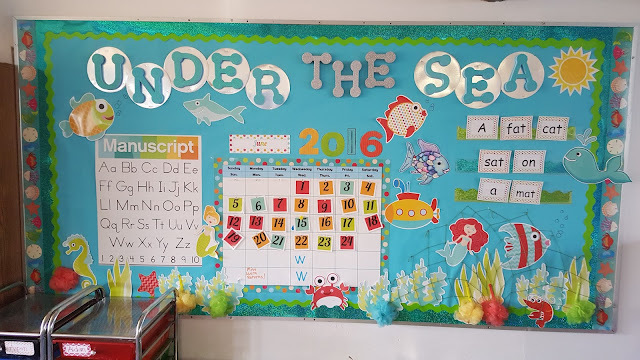 This fun banner is made from the paper that is a part of the School Girl Style "By the Sea" collection. My jellyfish are my absolute favorite part! These are plastic bowl from ALL-A-DOLLAR and I attached ribbons of all kinds to the inside, turned them upside down and punched a hole in the tops with a nail. Most of the bowls cracked when I did this, but it didn't matter, because I simply stuck a long piece of netting into the crack and tied a big know in it and then taped the netting into the inside. I then tacked the top of the netting to the ceiling, to created a "rope-like" hanger. My ceiling takes thumb tacks very well, since it is made of wood. **NOTE: The large jars you see in the back, that are stacked up, are animal cracker jars from Costco. We use animal crackers as snacks and then use the container jars to save our SENSORY BIN THEMED "ITEMS" in! We have collected 32 containers now, all with items for a specific theme. I'll do a post of this another time, showing some of the unique things we store in them and the themes they go to. I created an area called"THE CRAB SHACK" and did a bulletin board, under the clock, with pictures of kids pulling 'CRABBY" faces. I haven't learned how to blot out faces yet, so I'm not showing this board yet. 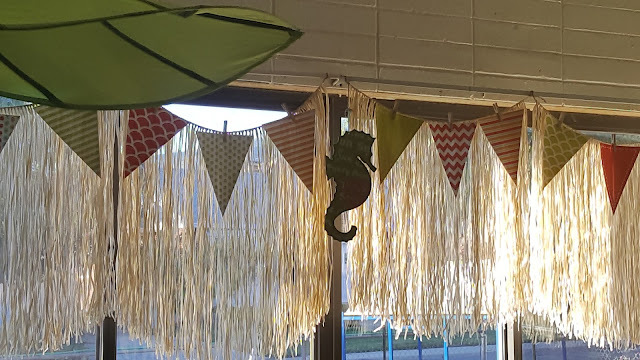 I will add, in another post, the fun items I collected and added to the DRAMATIC PLAY AREA for our "CRAB SHACK" restaurant, including menus and place mats... 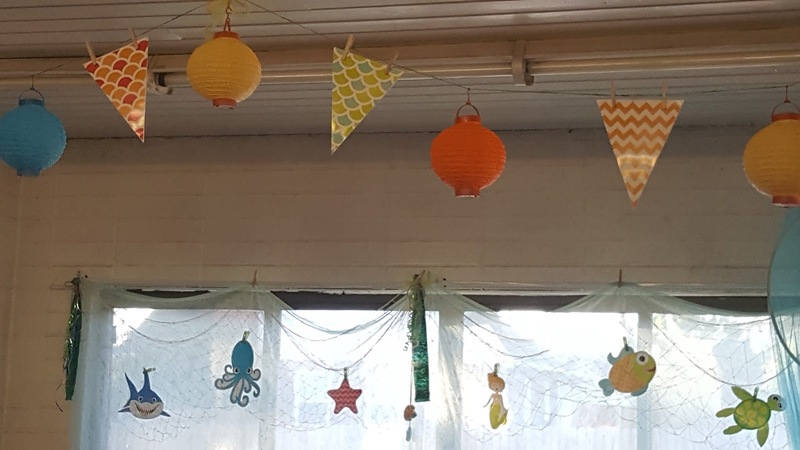 The lanterns and banner help to distinguish or divide off this area. 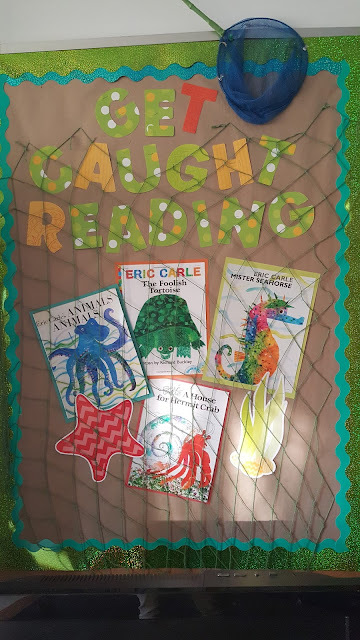 This bulletin board is by my book bins. See larger pictures at the bottom of post. This is my CIRCLE TIME BOARD! Plus I use an easel and other items as well. 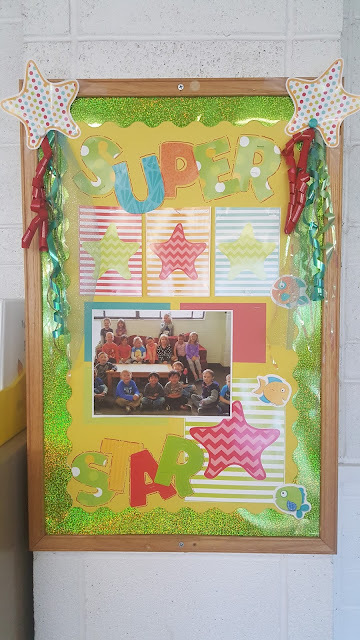 This board will be used for our BIRTHDAY KIDS or as a "SUPER STAR, SPOTLIGHT" BOARD. 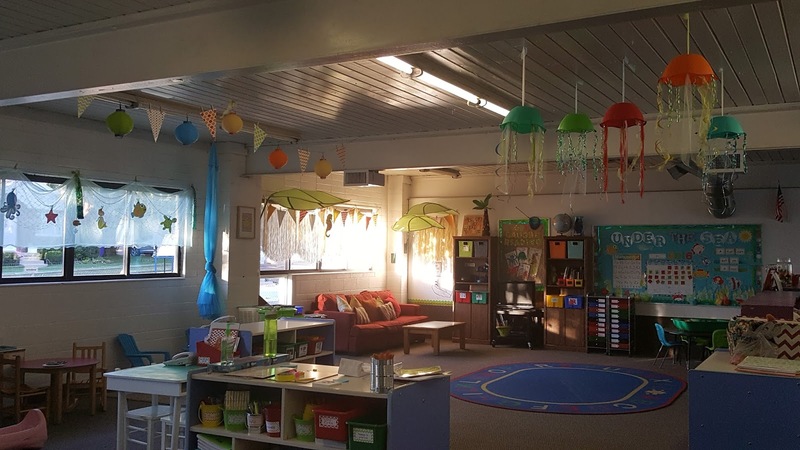 Here is a picture of the classroom from one direction. 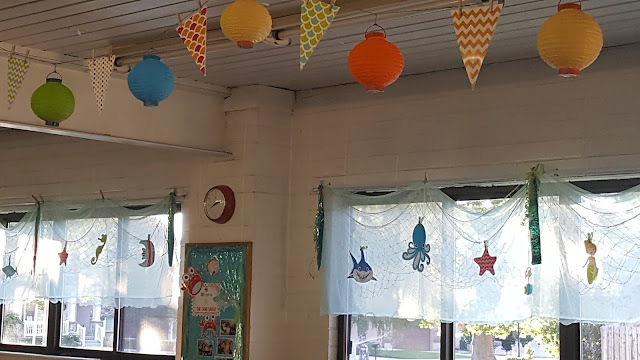 I'll be adding pictures of each LEARNING CENTER soon. I currently have the following centers: ART AREA, DISCOVERY & SCIENCE ZONE, DRAMATIC PLAY AREA, CONSTRUCTION ZONE (BLOCKS..); WATER/SAND TABLE or better known to the kids as the SENSORY BIN; WRITING STATION; BOOK HUT; LISTENING AREA (COUCH); MUSIC AND MOVEMENT RUG; MANIPULATIVE TOYS; LITERACY CENTER; WOODWORKING TABLE and I am adding a COMPUTER TABLE! This makes 12 Learning Centers, 13 with the addition of the computers. We also have a GROSS MOTOR AREA OUTSIDE, which is a large playground area.